The Good Times Blog: "Excuse me sir, but you look fairy much like Donny Osmond!" "Excuse me sir, but you look fairy much like Donny Osmond!" There is no story to be told here. 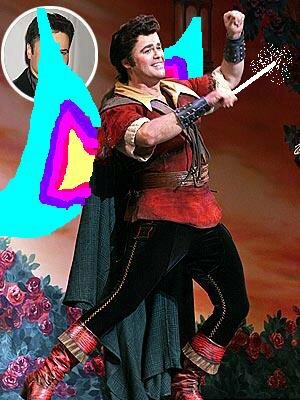 Donny Osmond is playing the evil villain Gaston in the Broadway production of "Beauty and the Beast". A reader submitted this photo for our consideration and we considered it hilarious enough to share. Congrats to Donny Osmond on not being dead and successfully pulling off this season's hottest trend, skinny pants and slouchy boots. *Thanks to Bucket for the tip.